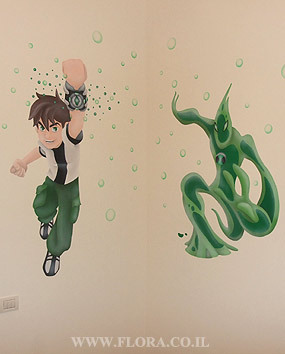 FLORA - MURALS - KIDS ROOMS - KIDS ROOMS - BEN 10 - BEN 10 AND OMNITRIX HERO GOOP FROM THE PLANET VISCOSIA. Ben 10 and Omnitrix hero Goop from the Planet Viscosia. Kids room murals. Muralist: Flora. Location: Yad Rambam.